Salivary gland damage leading to hyposalivation and xerostomia is one of the most common complications of radiation therapy. Xerostomia and associated complications amplifies the adversities faced by a patient. Providing relief from these complications plays an important role in maintaining the overall systemic health of the patient which directly and indirectly affects the treatment outcome. This article focuses on the pathogenesis of the salivary gland damage caused by radiotherapy and the different modalities to treat and alleviate the symptoms. The various approaches include symptomatic treatment of the complications, stimulation of salivary function, and the use of radioprotector to prevent the damage along with the emerging techniques of salivary gland regeneration. Salivary glands of the oral cavity can be classified into major salivary glands i.e. parotid gland, submandibular gland, sublingual gland and minor salivary glands that are present throughout the mucosa of oral cavity; both types having a similar structural framework of acinar and ductal cells organized as bunch of grapes on a stem . The principle function of acinar cells is the secretion of initial isotonic salivary fluid which is later modified by exchange of ions through the ductal cells and finally secreted into the oral cavity . The resting salivary flow in humans measures up to 0.3 ml/min and on stimulation it reaches to 1-1.5 ml/ min . Functionally, the parotids are purely serous whereas the submandibular are mixed with predominant mucous component . Central nervous system is responsible for regulation of salivary flow rates . Salivary gland function can be compromised by a great number of conditions including infections, systemic conditions such as diabetes, immune conditions, salivary gland tumours along with damage caused by chemotherapy and radiotherapy used as common treatment modalities for cancer . For management of tumour, surgical resection is the treatment of choice and is often combined with radiotherapy and chemotherapy especially when a complete excision of the tumour is not possible . Along with its use as an adjuvant, Radiotherapy can also be utilized as palliative therapy . The principle that underlies the therapeutic use of ionizing radiations is, the differential repair rates of normal tissue that are greater, as compared to the malignant cells and also the higher turnover rates of tumour cells . However, the ionizing radiations also effects the normal tissue lying in the field of radiation, including oral mucosa, vasculature, muscles, bones and more importantly the salivary glands [5-8]. This article gives a brief overview of the radiation induced damage of salivary glands and its management, including the newly emerging techniques. Ionizing radiations cause damage to a cell by impairing cellular Deoxyribose nucleic acid (DNA) . Due to these internal changes caused by radiations, the cells rather than undergoing growth and division, proceeds towards apoptosis [6,7]. The production of reactive oxygen species (ROS) by NADPH oxidase complex enzymes and redox reactions involving heavy metals cause lipid peroxidation and lysis of the granules releasing their proteolytic enzymes into the cell cytoplasm results in Apoptosis [10,11]. a) Immediate Phase: occurs within few hours of the exposure and the first signs of cell damage become evident. b) Short Phase: occurs within few weeks and is characterized by edematous changes and attempts towards recovery. d) Extended Phase: it depends on the number and size of fractions, linear energy transfer and response modifiers . The radiation induced cell death depends upon the radiosenstivity of a tissue and tissue turnover rate, the salivary gland tissue being composed of highly specialized secretory epithelial cells (serous acinar cells) with a life span of over a month . The major pathways involved in the damage of these salivary cells that have been highly debated are: Apoptosis, Necrosis and Autophagy. The pathway that rhymes with this serous acinar damage had been attributed to Apoptosis whereas the necrosis and autophagy have not been reported significantly responsible for the radiation sensitivity and persistent loss of function in salivary glands . The cell killing by radiation occurs as reproductive death and interphase death. The reproductive death is associated with the cell cycle characteristics whereas the interphase death is independent of cell division . In 1984, Abok et al. presented the concept of generation of free radicals that through peroxidation of secretory granules membrane makes them permeable to leakage of enzymes causing cell lysis . However the concept was strongly opposed . As it was observed in further researches, even when the gland function was severely affected, there was not much disappearance of acinar cells [9,10,17]. Next the plasma membrane of the cell was widely suggested as target for the radiation induced damage. According to this concept the irradiated cells do not disappear but there is loss of cell function . The free radicals generated through radiolysis of water target the membrane phospholipids causing membrane damage . This has been hypothesized to result in damage of plasma membrane associated G-protein coupled signal transfer which later on proceeds to involve the second messenger signal transduction pathway . The decrease in secretion of water seen during the acute phase had been attributed to the effects of damage to plasma membrane channels, AQP5 aquaporins responsible for movement of water . This is supported by another study suggesting that the morphological changes including vacuolization, disruption of plasma membrane and nuclear changes including clumped chromatin are believed to cause acinar damage . Another mechanism put forward to explain the acute effects is that the immediate alteration in salivary function to some extent might be caused by the nutritional deficiencies that resulted due to development of concomitant mucositis compromising food intake . It has also been purposed that there is presence of two classes of acinar cells i.e. the secretory cells, damage to which was responsible for the acute effects and the dividing cells whose inability to divide and replace the secretory cells manifests as the long term effects and gland atrophy . The often permanent and progressive late complications are seen to increase with an increase in size of fraction or decrease in number of fractions with an equivalent total dose . As purposed by Marx, reduction in cell population (hypocellularity), decreased blood supply and hypoxia hold an important position in the poorly understood mechanism of the damage caused by radiation [5,20]. Damage to vascular endothelium (hypovascularity) and connective tissue causes diminished oxygen delivery (hypoxia) to the tissue compromising the aerobic respiration and cell death [1,5]. Fibrosis, which is seen commonly during the later phase, has apparently been associated with chronic expression of a tumour growth factor-TGB β, a known stimulant of proliferation and differentiation of fibroblasts into fibrocytes responsible for increased collagen synthesis . Studies conducted by on histological sections of the gland taken few weeks post radiotherapy showed features of fibrosis, atrophy of the acini, loss of parenchyma, dilation of striated ducts with proliferation and dilation of intercalated ducts . Hyposalivation: Exposure of salivary glands to irradiation leads to hyposalivation resulting in xerostomia. In humans, the salivary flow is reduced to half after only a week into the radiotherapy with permanent damage at total dose of 5000 cGy or greater which is a common anticipation during treatment of most of the epithelial malignancies where the total dose reaches up to 6,500 to 7,500 cGy . Along with decrease in flow rates, the salivary composition is also changed with reduced amount of immunoglobulin, decreased buffering capacity and increases viscosity. Hyposalivation may cause the patient to face following challenges (Table 1). Table 1. 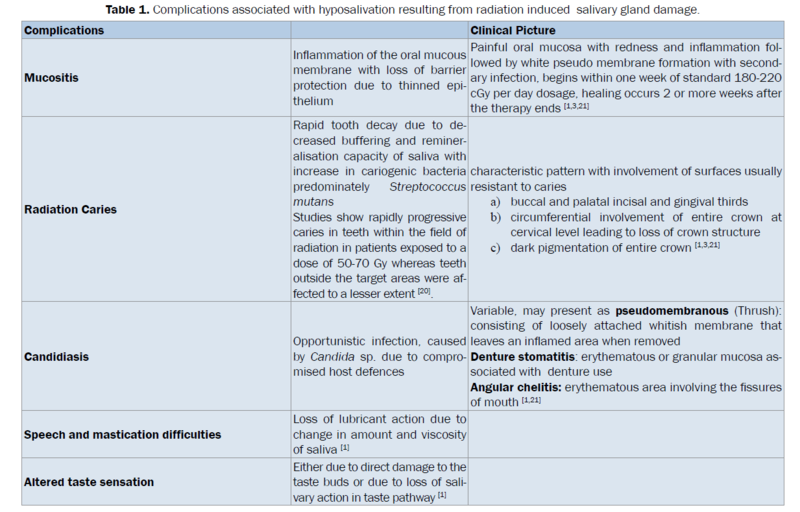 Complications associated with hyposalivation resulting from radiation induced salivary gland damage. Sialadenitis: Sialadenitis is the term used for salivary gland inflammation . It is a common complication encountered during radioactive iodine therapy used for the treatment of differentiated thyroid cancer. It presents itself within 24 hours of initiation of therapy, resolves on its own after a few days with permanent damage occurring in few cases [21-25]. The chief complaint of the patient is pain in the effected gland, along with swelling and reduced salivary function . The suggested underlying mechanism is the presence of active transport pump in the salivary gland cells which accumulates radioactive iodide ion due to similarity in its size and charge to other ions . The radioactive iodine results in the endothelial cell damage of the periductal capillaries leading to periductal inflammatory infiltration, causing duct constriction and transient swelling due to salivary fluid retention in the gland [25,26]. With increasing pressure the duct obstruction is usually removed spontaneously and the symptoms diminish . Parasympthetic Drugs: These are substances that bind to cholinergic receptors and mimic the effects of acetylcholine . So far; Pilocarpine is the most researched Sialogouges and is known to stimulate salivary function in both non irradiated volunteers as well as patients suffering from radiation induced xerostomia when used in a suggested dose of 5-10 mg three times a day for minimal side effects [1,2]. In different experiments, Pilocarpine was beneficial for protection against the acute effects of radiation but not so capable in providing defence against long term damaging effects of ionizing radiations when used by itself . For systemic Pilocarpine to be effective residual salivary function was an important criteria and its absence was one of the reasons why a large number of patients failed to respond to Pilocarpine treatment. Along with this, the development of side effects due to generalized parasympathetic stimulation was the primary reason for its withdrawal . Its use is contraindicated in patients with uncontrolled asthma, cardiovascular disorders and patients with narrow angle glaucoma . Pilocarpine being effective on unstimulated salivary flow rates suggests that mechanism of action is gland stimulation and not gland protection  (Table 2). Table 2. Management of damaged salivary glands. Another Muscarinic receptor (particularly M3) agonist, Cevimeline, used in a dose of 30 mg three times a day has shown to induce some degree of salivary gland stimulation, with reduced pulmonary and cardiovascular side effects as these the drug acts on receptors found mainly in salivary and lacrimal glands [31,32]. Cevimiline is more effective when used pre-treatment, through its radioprotective effect, the proposed mechanism of action being the elevation of intracellular calcium that increases translocation of AQP5 . Bethanechole, a cholinergic-Muscarinic agonist when used in daily dose of 75 mg-200 mg is beneficial without the gastrointestinal side effects [1,32]. Anetholetrithione, an agent known to up regulate the receptor sites in acinar cells, works in a synergist way to increase salivary function when used simultaneously with a parasympathetic agonist . Sugarless Gums and Candies: Sugarless gums help to stimulate salivary flow when there is some residual gland function present . The efficacy is limited due to inability to use these during sleep . Malic Acid And Ascorbic Acid: Although use of citric acid containing products results in increased salivary secretion, these should be used with care as increased acidity may further demineralize the teeth and cause irritation to the damaged mucosa [32,33]. Acupuncture: Acupuncture, although not a well researched technique for gland stimulation, has shown to provide beneficial effects in patients with residual gland function . Studies being conducted have shown results varying from temporary relief from xerostomia to no improvement in symptoms . This includes the use of commercially available artificial salivary substitutes . Substitutes are used when there is no residual gland function and gland stimulation is not an option . These products are formulated to mimic the salivary texture and electrolyte composition along with a pleasant flavour for patient acceptance but they lack the antibacterial and digestive functions of whole saliva [1,35]. Patients are instructed to consume a soft moist diet avoiding foods that can precipitate oral dryness and cause further irritation to the mucosa, such as alcoholic beverages, tobacco, acidic and spicy food, dry food such as crackers etc. and food should be consumed with frequent sips of liquid to facilitate swallowing and prevent aspiration . Use of oral prosthesis should be avoided whenever feasible as they cause irritation to the mucosa . Radioprotectors: These are cytoprotective substances, which are claimed to have the potential to increase tolerance of normal tissue to ionising radiations . • Amifostine: Developed by the U.S Army Anti-Radiation Drug Development program, it is the first drug to be approved by the FDA for its use as a radioprotective agent in humans [1,37]. It is a thiol containing inactive prodrug which is dephosphorylated by plasma membrane Alkaline Phosphate enzyme to its active metabolite WR-1065 that acts through its scavenging effect on the toxic free radicals . The presence of an acidic and hypovascular environment in the tumour tissue renders the enzyme inactive thus decreasing its effects on tumour cells . Side effect commonly seen following amifostine therapy is vomiting, hypotension, metallic taste and idiosyncrasy reactions . Subcutaneous amifostine showed significant reduction in development of mucositis as compared to the control, with lesser side effects and complete absence of hypotension [38,39]. It is also seen that amifostine plays a significant role in salivary gland protection which is evident through the reduction in severity and duration of post radiotherapy xerostomia with patient follow up to two years . In summary the available data points towards the beneficial role of amifostine in protection of salivary glands . • Histamine: Histamine, a biogenic amine synthesized by decarboxylation of histidine known to play part in diverse number of physiological as well a pathological functions, is currently being investigated as a potential radioprotector . In various studies it has been observed that the use of histamine showed preservation of glandular mass, decreased apoptosis of ductal and acinar cells and preservation of cell proliferation capacity . The protective effect of histamine on intestinal mucosa from the radiation induced damage is through the up regulation of mucosal epithelium proliferation and reduction in number of cells undergoing apoptosis . In salivary gland, the proposed mechanism of action is that histamine causes translocation of Aquaporin-5 channels, responsible for water transport in salivary acini . The drawbacks include the development of toxicities thus limiting the dose and the fact that the radioprotective effect might be extended to tumour cells negating the effects of radiotherapy . • Keratinocyte Growth Factor (KGF): KGF is a member of fibroblast growth factor family (FGF-7) known to stimulate proliferation of epithelial cells . It was concluded that treatment with KGF post radiotherapy resulted in increased proliferation of salivary gland stem cells that had survived through the radiotherapy whereas pre-treatment with KGF resulted in increased stem cell population to start with which ultimately lead to a larger proportion of cells that survived post therapy, but no change in radiosenstivity of the cells was noticed . Again the chief concern for using KGF as a radioprotector is its capability to extend the proliferating effect to the tumour cells . • Tempol: Tempol, a stable nitroxide, is one of the promising drugs under clinical trial to act as a radioprotector . It is a scavenger of free radicals thus providing defence against ROS such as H2O2 . Tempol provides the radioprotective effect selectively to the normal tissues due to the fact that the reduction product of Tempol does not have its protective properties and as tumour tissue is characterized by significant anoxia, Tempol is reduced and rendered ineffective . • IGF-1: IGF-1 is currently being investigated as a potential agent for treating patients with established xerostomia following radiotherapy . Insulin like growth factor-1(IGF-1) belongs to a family of peptides that resembles insulin in its structures, is secreted by a number of tissues but predominately by the liver under the influence of growth hormone . The mechanism of action was purposed to be the activation of endogenous Akt which is known to play an essential role in apoptosis suppression . IGF-1 has shown a significant role in restoring the radiation induced loss of function . Again the drawback encountered is the apprehension of its effect on tumour cells where it may act as promoter of tumour growth, however to counter this concern various strategies are being developed for specific tissue delivery methods . • Phenylephrine: It is a synthetic adrenergic agonist that binds to alpha-adrenergic receptors particularly alpha 127. Pre-treatment with Phenylephrine has shown significant reduction in the effects of ionising radiation including acinar cell atrophy and fibrosis and induced cell proliferation through up regulation of second messenger pathway by the drug . This protective effect was suggested to be due to activation of membrane receptors leading to up regulation of receptor coupled G-protein system  (Table 3). Table 3. Management of Xerostomia induced complications. • Intensity Modulated Radiotherapy (IMRT):The principle underlying use of IMRT is the use of computer controlled delivery system to deliver dose in form of a beam that adapts to the three dimensional shape of the tumour while decreasing the dose received by the adjacent structures to a minimal level. Thus due to reduced development of side effects and complications, a greater dose can be delivered to the tumour [50-52]. Patient immobilisation is a crucial part of the therapy; techniques utilized include use of head holders, tattoos or markings on particular face landmarks, bandages, custom acrylic mould and oral devices to position the maxilla and the mandible . The use of IMRT causes significant decrease in post radiotherapy xerostomia as compared to conventional radiotherapy . Some of the challenged faced during use of IMRT are that improper tumour coverage and uneven dose gradient can cause tumour reoccurrence. Also the technique is complex with higher requirements of staff and expensive equipments . AMT (Adaptive IMRT) is a newer approach in which dose replanning is done during the course of the treatment to prevent overdose to salivary glands due to changes encountered, such as shrinkage of tumour size and change in body weight . Submandibular Gland Transfer: It is a minor surgical procedure in which the submandibular gland of one side is relocated into the sub mental space i.e. out of the field of radiation where it is protected . Various studies and trials have reported a significant preservation of gland function following its transfer [57,58]. Stem Cell Translantation:Stem cells have the capacity to divide and differentiate into various types of mature cells. Research has shown the presence of stem cells in the intercalated duct system near the acini in salivary glands. These cells are believed to have the potential to divide and regenerate acini and ducts. At present, it is merely a concept that requires further research and development to have a practical implication . Tissue Engineering: It is the integration of principles of engineering and life sciences to develop methods for repair or replacement of damaged tissue. This technology was used for development of artificial salivary gland. It comprises of a blind tube resembling the natural duct system, implanted into the buccal mucosa. The tube is made from a Bio compatible biodegradable homo polymers or copolymers of lactic or glycolic acid. This tube helps in the formation of single layer of polarized epithelial cells that produce saliva. Important factor to consider is the timing of implantation. Pre- treatment implants may not survive the radiation exposure, whereas post therapy the mucositis may compromise the growth. As mentioned earlier, further exploration of the subject is required for conclusive outcomes . Greenberg MS, et al. Burket’s Oral Medicine (11th edition), BC Decker Inc. 2008. Berk LB, et al. Pathophysiology and management of radiation-induced xerostomia. J Support Oncol. 2005;3(3):191-200. White SC and Pharoah MJ. Oral Radiology (7th edition), Elsevier. Diagnosis and management of head and neck cancer, a national clinical guideline. 2006. Stramandinoli-Zanicotti RT, et al. Effect of fractionated radiotherapy on the parotid gland: an experimental study in Brazilianminipigs. International archives of otorhinolaryngology. 2013;17(2):163-167. Muhvik-Uric M, et al. Imbalance between apoptosis and proliferation causes late radiation damage of salivary glangs inmouse. Physiol Res. 2006;55:89-95. Konings AWT, et al. On the mechanism of salivary gland radiosensitivity. Int. J. Radiation Oncology Biol Phys. 2005;62(4):1187-1194. Blanco AI and Chao C. Management of radiation-induced head and neck injury. In Radiation toxicity: a practical guide.2006;23-41. Coppes RP, et al. Early radiation effects on muscarinic receptor-induced secretory responsiveness of the parotid gland inthe freely moving rat. Radiation Research. 2000; 153:339-346. Zeilstra JWL, et al. Radiation induced cell loss in rat submandibular gland and its relation to gland function. Internationaljournal of radiation biology. 2000;76:419-429. Abok K, et al. Morphologic and histochemical studies on the differing radiosensitivity of ductular and acinar cells of the ratsubmandibular gland. Virchows Arch Cell Pathol. 1984; 45(1):443-460. Khaled S and Held KD. Radiation biology: a handbook for teachers and students. International Journal of Radiation Biology.2012;88(11):858-859. Kumar V. Artificial salivary glands-An innovative treatment for salivary gland dysfunction. Indian J Stomatol. 2011;2(3):172-74. Stephens LC, et al. Radiation apoptosis of serous acinar cells of salivary and lacrimal glands. Cancer. 1991;67(6):1539-1543. Grundmann O, et al. Sensitivity of salivary glands to radiation: from animal models to therapies. J Dent Res. 2009;10:894–903. Vissink A, et al. A functional and chemical study of radiation effects on rat parotid and submandibular/sublingual glands.Radiation research. 1990;124(3):259-265. Coppes RP, et al. Early to late sparing of radiation damage to the parotid gland by adrenergic and muscarinic receptoragonists. British Journal of Cancer. 2001;85(7):1055-1063. El-Direny, Shalaby NM, Afifi OK. Effects of irradiation on secretory cells of submandibular gland of adult male albino rat:histological and immunological study. Egypt J. Histo. 2009;32:324-332. Nagler RM, et al. A 2 week pair-fed study of early X-irradiation effects on rat major salivary gland function. Archives of oralbiology. 1996;41(7):713-717. Marx RE. Osteoradionecrosis: a new concept of its pathophysiology. Journal of Oral and Maxillofacial Surgery. 1983;41(5):283-288. Andrews N and Griffiths C. Dental complications of head and neck radiotherapy: Part 1. Australian dental journal.2001;46(2):88-94. Willich N, et al. The development of radiation caries after high doses of irradiation Strahlentherapie und Onkologie: Organder Deutschen Rontgengesellschaft. 1988;164(8):466-473. Dreyer JO, et al. Radiation-induced sialadenitis. Stage classification and immunohistology. Pathologe 1989;10(3):165-170. Cawson RA, et al. The pathology and surgery of the salivary glands Isis Medical Media. 1997. Ma C, et al. Amifostine for salivary glands in high-dose radioactive iodine treated differentiated thyroid cancer. CochraneDatabase Syst Rev. 2010;7. Mandel SJ and Mandel L. Radioactive iodine and the salivary glands. Thyroid. 2003;13(3): 265-271. Warde P, et al. A Phase III placebo-controlled trial of oral pilocarpine in patients undergoing radiotherapy for head-and-neckcancer. International Journal of Radiation Oncology Biology Physics. 2002;54(1):9-13. Clark MA, et al. Lippincott’s illustrated reviews (5TH edition). Lippincott Williams and Wilkins. Davies AN, et al. "Parasympathomimetic drugs for the treatment of salivary gland dysfunction due to radiotherapy." TheCochrane Library. 2007. Scarantino C, et al. Effects of pilocarpin during radiation therapy: results of RTOG 97-09, a Phase III randomized study inHead and Neck cancer patients. Journal Of Supportive Oncology. 2006;4:252-258. Takakura K, et al. Effect of cevimeline on radiation-induced salivary gland dysfunction and AQP5 in submandibular glandin mice. The Bulletin of Tokyo Dental College. 2007;48(2):47-56. Gupta A, et al. Hyposalivation in elderly patients. J Can Dent Assoc. 2006;72(9):841-846. Hancock PJ, et al. Oral and dental management related to radiation therapy for head and neck cancer. J Can Dent Assoc.2003;69(9):585-590. Ship JA. Diagnosing, managing, and preventing salivary gland disorders. Oral diseases 2002;8(2):77-89. Sankar V and Terezhalmy GT. Salivary Gland Dysfunction: Etiology, Epidemiology, Clinical Manifestations, Diagnosis, andTreatment. Autonomic nervous system. 2012;1(2):3. Xiang B, et al. Mechanism of the protective effect of Phenylephrine pre-treatment against irradiation-induced damage inthe submandibular gland. Experimental and therapeutic medicine 2013;5(3):875-879. Kouvaris JR, et al. Amifostine: the first selective-target and broad-spectrum radioprotector. The oncologist 2007;12(6):738-747. Koukourakis MI, et al. Subcutaneous administration of amifostine during fractionated radiotherapy: a randomized phaseII study. Journal of Clinical Oncology. 2000;18(11):2226-2233. Anné PR and Curran WJ. A phase II trial of subcutaneous amifostine and radiation therapy in patients with head and neckcancer. InSeminars in radiation oncology. 2002;12:18-19. Wasserman TH, et al. Influence of intravenous amifostine on xerostomia, tumor control, and survival after radiotherapyfor head-and-neck cancer: 2-year follow-up of a prospective, randomized, phase III trial. International Journal of Radiation Oncology, Biology, Physics. 2005;63(4):985-990. Medina VA, et al. Mechanisms underlying the radioprotective effect of histamine on small intestine. International journal ofradiation biology. 2007;83(10):653-663. Medina VA, et al. Histamine prevents functional and morphological alterations of submandibular glands induced by ionisingradiation. International journal of radiation biology. 2011;87(3):284-292. Rubin JS, et al. Keratinocyte growth factor. Cell biology international. 1995;19(5): 399-411. Lombaert I, et al. Keratinocyte growth factor prevents radiation damage to salivary glands by expansion of the stem/progenitor pool. Stem Cells. 2008;26(10):2595-2601. Vitolo JM, et al. The stable nitroxide tempol facilitates salivary gland protection during head and neck irradiation in a mousemodel. Clinical cancer research. 2004;10(5):1807-1812. Chatterjee PK, et al. Tempol, a membrane-permeable radical scavenger, reduces oxidant stress-mediated renal dysfunctionand injury in the rat. Kidney international. 2008;58(2): 658-673. Grundmann O, et al. Restoration of radiation therapy-induced salivary gland dysfunction in mice by post therapy IGF-1administration. BMC cancer. 2010;10(1):417. Laron Z. Insulin-like growth factor 1 (IGF-1): a growth hormone. Molecular Pathology. 2001; 54(5):311. Limesand KH, et al. Suppression of radiation-induced salivary gland dysfunction by IGF-1. PLOS One. 2009;4(3):4663. Tolentino EDS, et al. Oral adverse effects of head and neck radiotherapy: literature review and suggestion of a clinical oralcare guideline for irradiated patients. Journal of Applied Oral Science. 2011;19(5):448-454. Sinada G. Oral care protocol: For the head and neck cancer patient. Baltimore, Maryland: Johns Hopkins Medical Center.2014. Lee N, et al. Intensity-modulated radiation therapy in head and neck cancers: An update. Head & neck. 2007;29(4):387-400. Nutting CM, et al. Parsport Trial Management Group. Parotid-sparing intensity modulated versus conventional radiotherapyin head and neck cancer (Parsport): a phase 3 multicentre randomised controlled trial. The lancet oncology 2011;12(2):127- 136. Chao KS, et al. Intensity-modulated radiation therapy in head and neck cancers: The Mallinckrodt experience. InternationalJournal of Cancer. 2000;90(2):92-103. Castelli J, et al. Impact of head and neck cancer adaptive radiotherapy to spare the parotid glands and decrease the risk ofxerostomia. Radiat Oncol. 2015;10(6). Jha N, et al. Prevention of radiation induced xerostomia by surgical transfer of submandibular salivary gland into thesubmental space. Radiotherapy and oncology. 2000; 66(3):283-289. Wijers OB, et al. Patients with head and neck cancer cured by radiation therapy: A survey of the dry mouth syndrome inlong-term survivors. Head & neck. 2002;24(8):737-747. Heck K. Prevention of radiation induced xerostomia and improved quality of life: submandibular salivary gland transfer.Canadian Journal of Medical Radiation Technology. 2003;34(3):10-15.